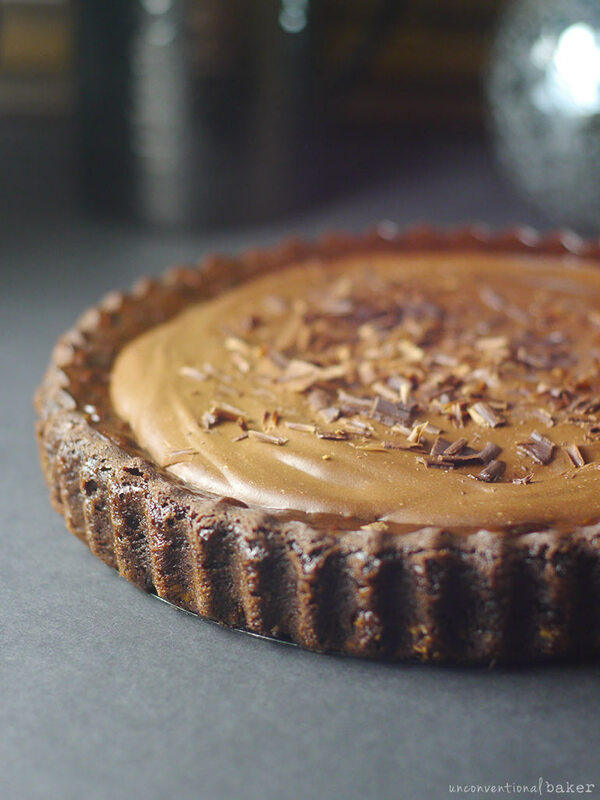 This dreamy chocolate mousse pie happened last week, and it’s been hard to get it off my mind. It turned out so rich, decadent, and with an amazing salted chocolate flavor. 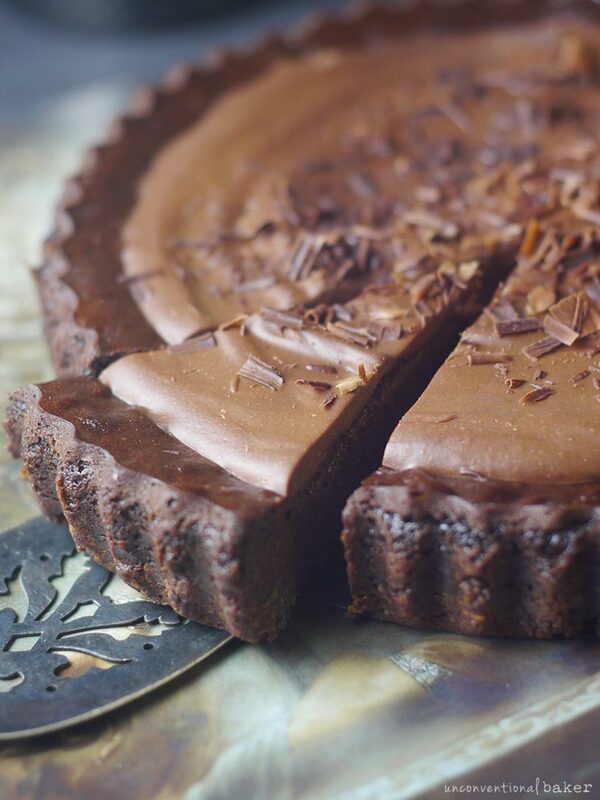 It’s totally the kind of chocolate pie that’s sure to satisfy all your chocolate cravings. A chocolate lovers’ dream. A light and barely there chocolate crust, a rich soft chocolate mousse filling with a brownie like edge, a deliciously light chocolate topping, and some chocolate shavings on top for good measure. We’re talking chocolate on chocolate on chocolate on chocolate here! So simple, but so so good. One of my favorite parts about this dessert is that it’s not a frozen treat. It’s nice and soft from the fridge and will hold up well at room temperature too, provided it’s not super hot where you live. I love the raw cakes and cheesecakes very much, but sometimes you just want something a little bit softer and lusher — this pie hits the spot. 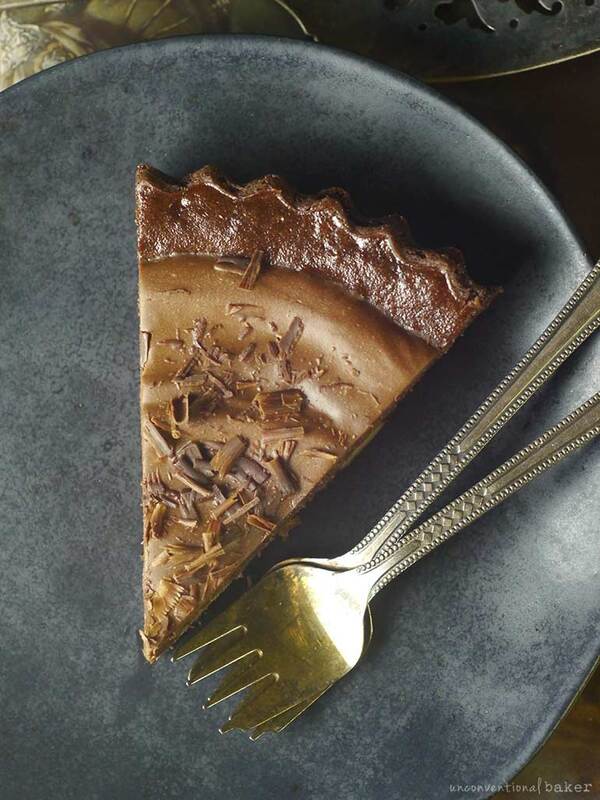 Just a quick note about the recipe before you get to taste all the chocolatey goodness for yourself, since I think the photos might throw some people off — you don’t need to make a crust for the edges of the pie. 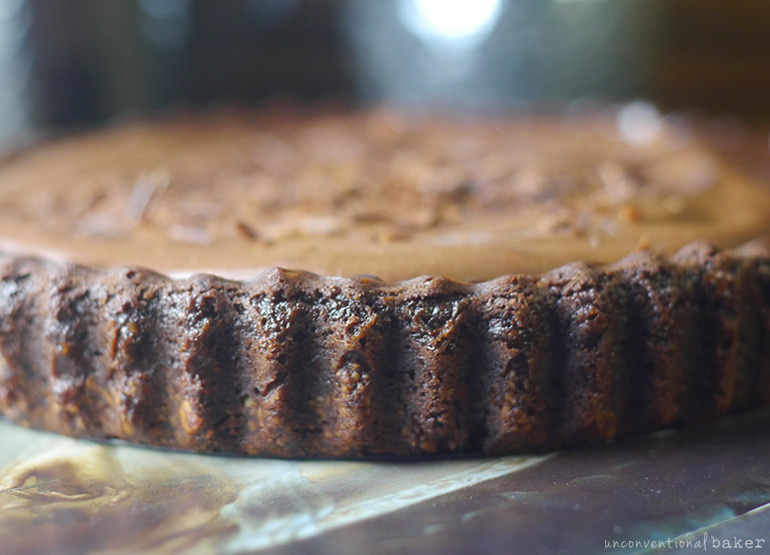 That brownie-like crust along the edges that I mentioned above and that you can see in the photos is something that happens naturally as the filling bakes. Another quick note is that the recipe is “calibrated” to work as is (the balance of sweetness to saltiness, for example, etc.). If you modify any of the ingredients, be sure to adjust the flavors to taste (for example if you use an unsweetened yogurt, the amount of salt in the pie might be a bit overpowering and so should be reduced a little, etc.). Another quick note about the pan size: the tart pan you’re using should have a taller edge to it. I have several 7″ tart pans, and some have taller rims than others. You need a rim that’s about 1 1/2″ tall (like this one, for example) as the pie rises slightly as it bakes. Last but not least, just wanted to add that the crust in this pie is very thin — it’s meant to be barely there. The purpose of it is to make the mousse layer come out of the pan more easily, and also to make sure it doesn’t leak through the pan in the beginning stages of baking (as it seals the edge around the removable plate at the base). 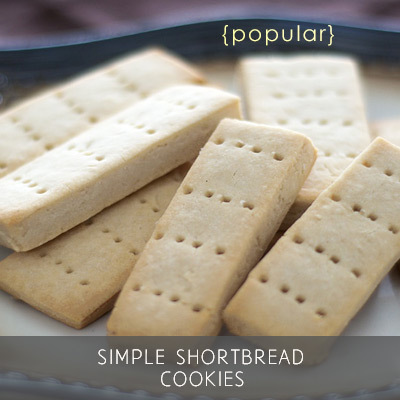 So don’t be surprised it’s very thin — that’s the plan ;) But If you like crusts, feel free to double or triple it even depending on where you want to go with the dessert. Just make sure there’s enough room for the filling to rise and not spill over. 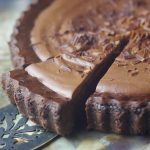 A decadent gluten-free, grain-free, and vegan chocolate mouse pie recipe with a chocolate topping. Preheat oven to 350F. Oil a 7″ tart pan (the walls should be at least 1½” tall — like this one) with a removable bottom and set aside. Process all crust ingredients into a fine sticky crumble in a food processor. Transfer this mixture into the tart pan and press down into an even thin flat crust along the base with your hands. Set aside. Blend all filling ingredients until completely smooth in a high power blender. Pour the filling over the crust in the pan and bake in a pre-heated oven for 40 mins. 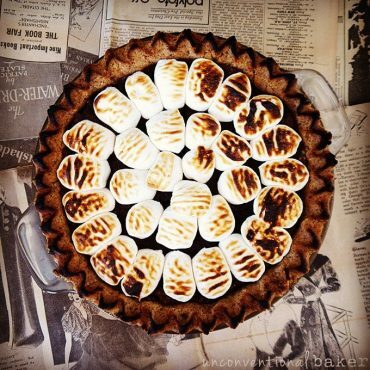 Note: keep an eye out to make sure the top is not burning. Remove the pie from the oven and cool on a cooling rack for 30 mins or so, then remove out of the pan. Note: the cake will be domed when it comes out of the oven and will deflate as it cools — this is normal. Once the pie is cooled off, stir the yogurt with the melted dark chocolate to make the topping. Spread this topping over the baked pie. Sprinkle with some shaved chocolate (note: it’s important that the cake has cooled off for this, as otherwise the sprinkled chocolate will melt from the warmth of the cake). Chill the pie in the fridge for 20 mins (or longer) to let the topping set and enjoy! Keep leftovers refrigerated. *I used an agave-sweetened vanilla coconut yogurt. If using an unsweetened yogurt, add 2 tbsp coconut sugar to the filling (or to taste), and 1 tbsp maple syrup to the topping layer. 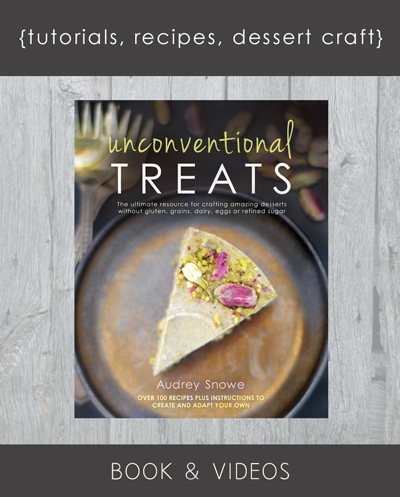 Disclaimer: this post contains an affiliate link to a 7″ tart pan. 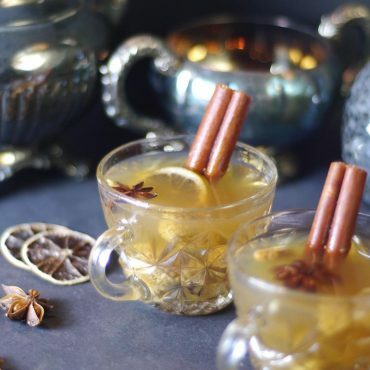 Hi Anca, you can try this DIY one from Minimalist Baker: https://youtu.be/1O-0_fyVzjs — seems pretty simple and straight forward :) and based in coconut milk. Can I leave out the yogurt if necessary? Will the only difference be in taste? 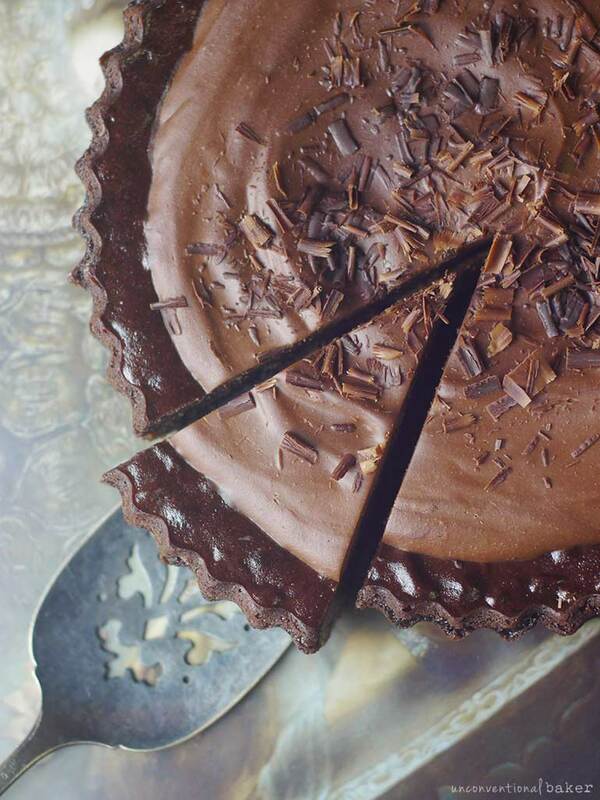 A gluten-free chocolate pie, what a dream this is! Will try it for sure! This sounds amazing! In the notes you say to add two Tablespoons of coconut sugar if using unsweetened yogurt. Do you mean to the total amount of yogurt before adding it in the three different places it calls for? I want to make this ASAP! Hi Andrea. Thanks for drawing my attention to it. I think I only thought about the unsweetened yogurt in the filling when I made that remark in hindsight, so going to fix it up now. For the crust, no need to add more sweetener. For the filling, 2 tbsp (or more to taste) is good. 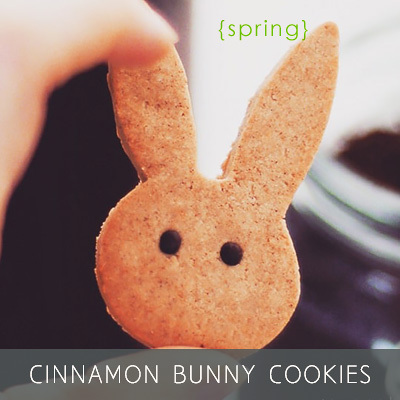 For the topping, I’d just add maybe 1 tbsp maple syrup instead (as coconut sugar will make it a a bit gritty). Can the crust be made with another type of nut? I get the filling should be cashews. Also what’s the texture of the filling after baked? I’ve never baked cashew cream desserts, only had chilled ones. Hi Liz. Definitely feel free to use a different nut for the crust if you prefer. The texture of this cake is pudding / mousse-like, so soft and melt-in-your-mouth consistency. 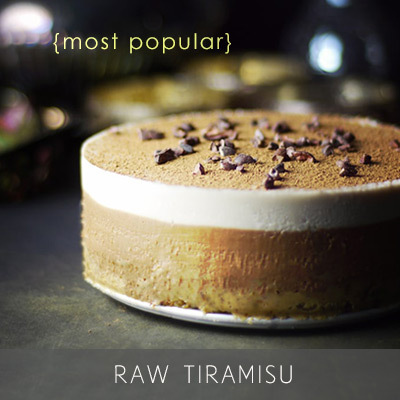 Quite different to a raw cashew-based cake. This looks amazing and I am trying out vegan…that being said, is there an alternative nut to cashews? Or would that significantly alter the flavor? I wanted to try this immediately! Then I saw it required yogurt. none in this berg. I’ll put it on my list and definitely try it when and if I ever get any. Darn!